Within the past few days, Dusty Baker was named manager of the Washington Nationals. He replaced Matt Williams, whose 179-145 record in 2014–15 wasn’t satisfactory for a team whose championship aspirations, with the likes of Bryce Harper, Ryan Zimmerman, Jayson Werth, and an opening day rotation (this season) of Max Scherzer, Steven Strasburg, Jordan Zimmerman, Gio Gonzalez, and Doug Fister, went bust when they missed the postseason altogether this year. The inexperienced Williams appears to have been generally disliked in the Nats’ clubhouse; with Baker, Washington gets one of the most experienced (17th in MLB history for both games and wins) and best-respected (in the clubhouse) managers around. He is one of only two men to win National League Manager of the Year (established in 1983) three times (Bobby Cox is the other). However, if was a Nationals fan, I would not be thrilled with this hiring. For starters, and speaking of starters, Baker came under scrutiny for his use of a pair of Cubs twirlers during his tenure in Chicago. 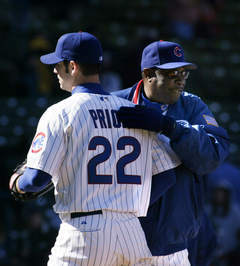 In 2003, he ran the highly-touted 22-year old Mark Prior out for 211+ innings, while averaging 113 pitches per start over the course of the season (for the uninitiated, 100 pitches is generally when a manager will seek to remove his pitcher, rookie or veteran, from the game). From 2004-2007 Prior suffered pitching-related injuries, and was let go after that last season, all of which was spent on the disabled list. Kerry Wood also had success and a high work-rate during the 2003 season, but, like Prior, made regular trips to the DL in the following three seasons, after which Dusty Baker was fired by the Cubs. Ultimately, during Baker’s tenure with the club (’03-’06), Wood went 26-26 in a mere 68 starts with a 3.56 ERA. Prior was 36-23 in 87 starts with a 3.55 ERA under Baker. But while these stats, missed starts aside, seem good, they certainly fail to live up to the hype surrounding both pitchers in their respective rookie seasons and thereafter. In fact, looking at 2004-6 alone, Wood and Prior went a combined 30-32 in 93 starts with a 4.12 ERA. Baker is also staunchly “old-school,” insofar that much of his managerial style contradicts tenets held by the sabermetric community. That’s not to say that making decisions based on “feel” or traditional decision-making are inherently wrong, but in many cases Baker seems to refute otherwise overwhelming statistical evidence that points to the contrary (e.g. a sacrifice bunt). Lastly, Baker, for all his regular season managerial experience, still has yet to claim the ultimate postseason prize: a World Series ring. In the aforementioned four seasons with the Cubs, they never won 90 games, and only made the postseason once–in 2003, when their inevitable championship was derailed by a bespectacled fan wearing a green turtleneck listening to the game on his Walkman. Prior to leading Chicago, Baker oversaw the San Francisco Giants for ten seasons, from 1993-2002. Seven of those ten teams finished above .500, with five of those exceeding 90 wins. Yet for all that regular season success (89.75 wins per season in the eight not impacted by the 1994-5 players’ strike), the Giants only made the postseason on three occasions, winning only one of seven games before 2002. 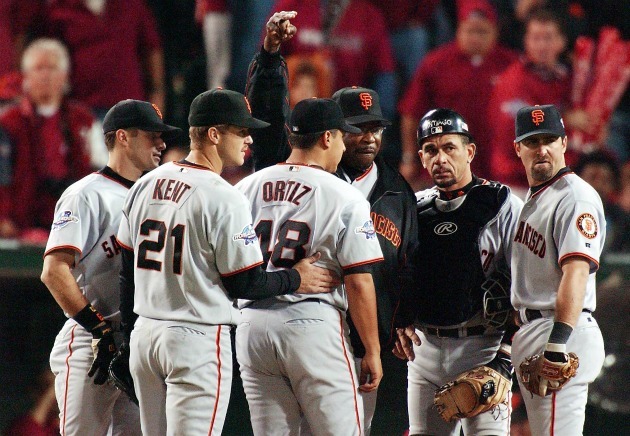 And in 2002, of course, the Giants were sitting on a 5-0 lead (and 3-2 series lead) heading in to the bottom of the 7th inning in game 6 in Anaheim. After starter Russ Ortiz recorded the first out of the inning, the Giants had about a 97% chance to win the game and the franchise’s first World Series since moving to the Bay Area in 1957. Ortiz and the rest of San Francisco’s ‘pen couldn’t make that seemingly insurmountable lead hold up, and the Angels won that game, plating three runs later in the 7th and three more in the 8th. The Giants went out with a whimper the following night; after the season, the Giants elected not to renew Baker’s contract, and he moved on to Chicago. After driving the Cubs in to the ground in just a few short years, Baker moved on to Cincinnati, where he would win two division titles and 90 games on three occasions in six seasons (2008-13). During his tenure there, he received familiar criticism for his overuse of Edinson Volquez. More to the point, in the Reds’ three postseason appearance, they went 2-7 under Baker. Those two wins came in among the more epic postseason collapses in baseball history. Cincinnati won the first two games of their 2012 National League divisional series against the Giants in San Francisco. In the best-of-five series, all they needed to was win one of the next three at Great American Ballpark and they would advance to the NLCS. They couldn’t even pull that off, and the Giants won the series and, eventually, the World Series. Overall, in his twenty seasons managing (one of which omitted the entire postseason due to the aforementioned players’ strike), Baker’s teams have made the postseason on seven occasions. Only two of those teams–the ’02 Giants and ’03 Cubs–advanced beyond the first round. Three teams–the ’97 Giants (NLDS), ’10 Reds (NLDS), and ’13 Reds (Wild Card)–failed to win a single game and were unceremoniously swept out of contention. He concluded 2013 with a 19-26 postseason record, and only two series wins to his credit. Those 2013 Reds also lost their final five regular season games prior to the Wild Card round, including the final three at home against Pittsburgh, which enabled the Pirates to host their subsequent postseason showdown. General manager Walt Jocketty admitted the Reds’ abysmal week was a significant factor in the club’s choice to fire their manager. In the end, it doesn’t seem as though Washington took a particularly close look at how Baker worked out at each of his previous three clubs. It’s not as though he took underdog clubs and ran with them all the way to the NLCS or World Series. He managed numerous MVP and Cy Young candidates and some stacked teams, but still has yet to win it all. Realistically, that’s what the Nationals are working with. They’re not a rebuilding franchise looking for a no-nonsense guy to straighten out a few bad apples; with the talent on their 40-man roster, there’s no way they shouldn’t have advanced to the NLCS this year (let alone made the postseason). And I’m not so sure, based on his track record, that Baker’s the guy to get them there.